Brother CS5055PRW Vs CS6000i, both are quite popular among beginners. But once you see the feature differences and price. You will have a clear choice. 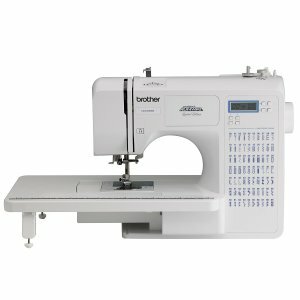 Brother CS5055PRW and CS6000i are two popular beginners sewing machines in U.S. Both these machines have been selling like hot cakes. CS6000i has been an out and out box office hit ever since it was released way back in 2007. CS5055PRW is a slightly newer machine when compared to CS6000i. CS5055PRW made its entry in the year 2010. So these machines have been around for a while. These two machines are worth comparing because of two reasons. One is that they are quite popular among beginners and the second reason is that they are similarly priced. In fact, the price difference is so small that only a few dollars separate them. As a sewer, I always look for sewing machines that offer more in value and performance, the price is always secondary for me. So I decided to have a closer look at these two machines, so that I can try my bit to help you out in choosing the best one. In this section, we will discuss the areas where these two machines differ. All other common features are listed in the table below. Main Functioning : These two belong to two different categories of sewing machines. CS5055PRW is an electric sewing machine, which is kind of a hybrid breed that has some features (not all) of mechanical and computerized machines. 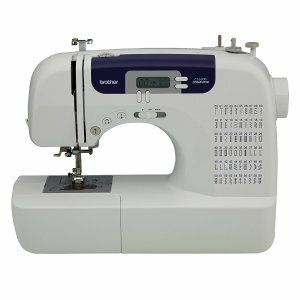 Whereas CS6000i is a fully computerized sewing machine. I think CS6000i sweeps away all the points here as it comes with a lot of options. It is more beginner friendly because of those extra computerized features. Built-in Stitches : Again CS6000i is the winner. It comes with 60 built-in stitches, whereas CS5055PRW has only 50 built-in stitches. Buttonhole Styles : Advantage CS6000i, with 7 one-step buttonholes. CS5055PRW comes with 5 one-step buttonholes. Start/Stop Button And Speed Control Slider : Being a computerized sewing machine, CS6000i has the sewing start/stop button and speed control slider. This gives you the liberty to sew without the foot pedal and still be in control of the sewing speed. CS5055PRW being an electric machine doesn’t have this feature. You will have to use the foot pedal all the time. I would always recommend a sewing machine with start/stop button and speed control slider, especially when the price difference is very small like these two machines. Needle Position Key : All the points for CS6000i. The option to choose the needle to stop in up or down position is huge if you quilt a lot. CS5055PRW doesn’t have this feature, instead you will have to turn the hand wheel every time you finish sewing. Quilting Table & Hard Cover : CS6000i comes with a quilting table and hard cover. The large quilting table makes it easy to work on large projects. CS6000i offers more value here as well. Sewing Machine Weight : This is the only area where CS5055PRW has a slight upper hand. CS5055PRW is 2.35 pounds lighter than CS6000i. Below table shows all the features of these two machines. Both machines use the same motor. So there isn’t much of a difference in performance. The machines are easy to set up. Both of them perform admirably well on different kind of fabrics. The stitch quality is pretty consistent. Ease of use wise, CS6000i is slightly ahead of CS5055PRW, this is mainly because of the extra computerized feature like needle position key. In my opinion, CS6000i offers more in value and it gives you lot more room to grow as a sewer. Price : This is where the decision is made 9 out of 10 times. The current price difference between CS5055PRW and CS6000i is just a couple of dollars (this can change in future, I am not sure). You have already seen that CS6000i has better specs and features. So I think it is worth spending few extra dollars on it. Moreover, CS6000i is way ahead of CS5055PRW in sales volume. 11 CS6000i’s are sold when 1 CS5055PRW is sold. This gives a clear indication of what people like. My theory is “If lot of people are buying something, there must be something really good in it”. So CS6000i is a better choice.